O God that I were there! The solo soprano, in fact, is symbolic of the human longing (one solo voice) for release into the transcendent (choir), of the individual’s desire to be absorbed into the cosmos. Her burden is always the same (‘Thy joys when shall I see?’) though always differently expressed musically, and the incidence of these stanzas of yearning is a factor Dyson puts to skilful use in avoiding stanzaic uniformity in his setting. Another is realizing the dramatic implications of the text in a way that in no way damages or deadens its spiritual resonance. A procession of pilgrims approaches from afar to repeated sighing phrases in the string quartet; the precious stones glint and glitter (harp arpeggios and spiky string semiquavers). The flood of life flows through the streets in ever-increasing jubilation until finally the gates are flung wide in a sunburst of sound – harp glissandi and repeated ecstatic cries of ‘Hierusalem!’ Now the picture begins to glow in rainbow hues (‘Thy saints are crowned with glory great’) and as the company of heaven is numbered in terms of child-like candour the music assumes as almost Pre-Raphaelite quality of chastely sensuous sweetness. It is a telling stroke (and typical of Dyson the dramatist) when the soprano’s entreating cries of ‘Hierusalem’ are ringingly echoed through the streets by the heavenly hosts (with full organ, here heard as such for the first and only time). Gradually the mists of the opening close in again, and the soprano has a last word as she soars up to her top B, then down, to end on a note of quiet rapture. 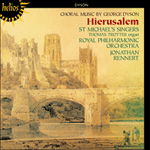 Hierusalem was composed in 1956 for Harold Darke and the St Michael’s Singers; the soprano at the first performance was Isobel Baillie. So it is appropriate that the performers on this recording should be the present-day St Michael’s Singers under Dr Darke’s latter-day successor, Jonathan Rennert. The somewhat distant choral perspective, rendered inevitable both in performance and recording by the acoustic disposition of the forces and by the density of the accompanimental texture, is clearly intentional on the part of the composer. He wants us to hear the chorus as literally heavenly, not of-the-earth. Have not their songs to seek.